OGSTM is an optimized code to solve 3D transport reactions non linear PDE applied to biogeochemical problems. It exploits the domain decomposition paradigm based on the MPI and the OPEN-MP library to scale the computation to large number of cores. 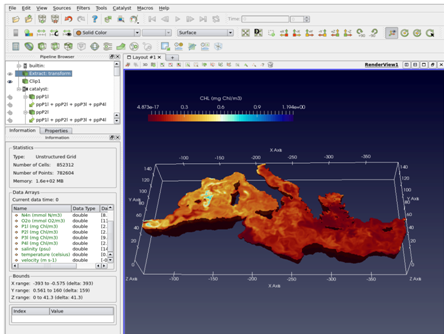 The tool simulates biogeochemical fluxes at Mediterranean scale and is used in several European projects and in the Copernicus service (CMEMS infrastructure, http://marine.copernicus.eu) and to perform multi decadal simulations to estimate the impact of global change to environmental indicators. 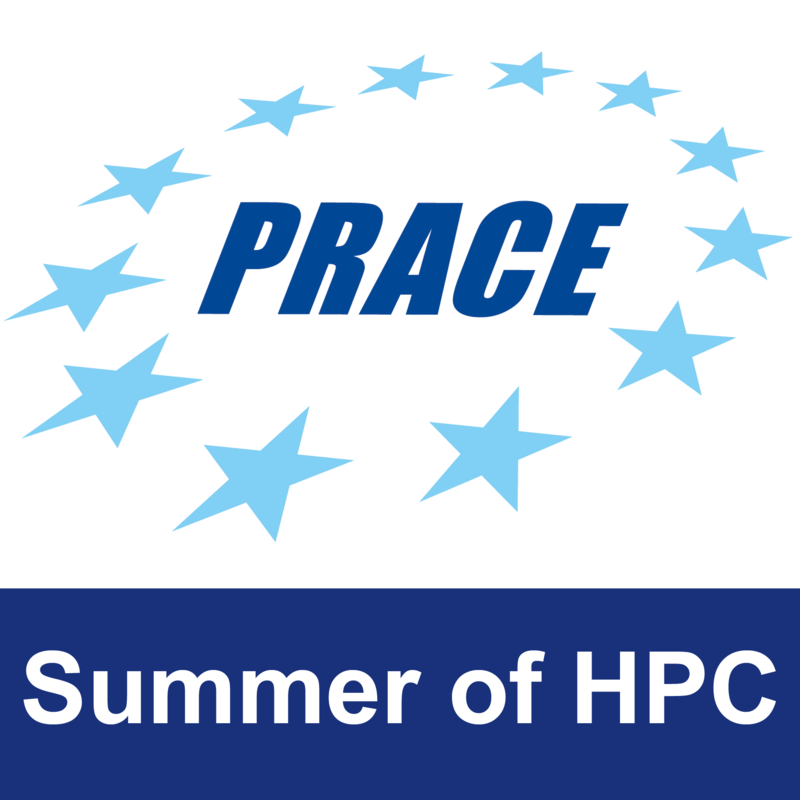 As high performance computing moves towards the exascale era, in situ approach is widely predicted to become more and more important as an efﬁcient tool for speed-up of large scale simulations. Following this pattern, the code, that is written in fortran90, has been recently equipped with a C++ ParaView Catalyst adaptor to exploit the in-situ approach. This solution (still in development) interface the model with ParaView software providing interactive on-the-fly visualization of the live simulation data, filtered by python visualization pipeline defined by the user. The usage model that are currently supported are either the direct access with ParaView client or full batch image sequence production. With this proposal we aim at explore web presentation capabilities of ParaView ecosystem to extend to the web current in-situ prototype a web presentation of day-to-day simulation activity. We propose to explore web presentation capabilities of ParaView ecosystem to add web presentation features to the current in-situ prototype. We will like to expose to the web some of the visualization capabilities available in the current 3D visualization tool. We would also like to extend the current tool to allow not just on-line monitoring of the running simulation but also off line (i.e. for post-processing) browsing of archived time evolution of the 3D fields of biogeochemical variables like marine chlorophyll and macro-nutrients. The advanced visualization tools available in ParaView Web like iso-surface and streamlines representation will be included in the plotting options following user needs. Datasets and model configurations will come from the real system operating in the European Copernicus service. The new App will be integrated by means of the in-situ approach in the parallel framework already developed or will be used in batch mode in order to explore archived data in an efficient way. Such tool will be designed and implemented to be portable to other coupled modeling systems used at OGS and for different purposes: from the long-term, multi-decadal runs to the operational work-flow embedded in the CMEMS infrastructure. Simulations and tests will be carried out in one of the supercomputers available at CINECA facilities. As an added value, the tool will be then integrated within the Visual-Lab facility at OGS, and will be important for scientific outreach activities also. Week 3: Problem analysis and deliver final Work-plan at the end of week. Week 4, 5: Production phase (A proper visualization work-flow will be implemented starting from existing outputs). Week 6, 7: Final stage of production phase (Depending on the results and time-frame, the visualization scripts will be adapted to the production work-flow). Preparation of the final movie. Week 8: Finishing the final movie. Write the final Report. The purpose of this project is to extend the a visualization tool within the current OGSTM-BFM model work-flow. Our final product will result in a visualization web interface based on ParaView Web as well as a movie illustrating the use and the results obtained during this 2 months work period. Also a small report on the work done will be produced. One foreseen expansion is the use of ParaViewCinema to pre-compute all relevant visualization artifacts during simulation phase in a completely batch work-flow. Beside the OGSTM-BFM model that is owned by OGS and will be provided in source form under a non-disclosure agreement, all other needed software (mainly ParaView and Blender) is released open source and already available on the CINECA clusters that will be used by the students with their own provided accounts.